For the love of all that is holy, AVOID this movie. Another failed video game adaptation bites the dust. When Callum Lynch (Michael Fassbender) explores the memories of his ancestor Aguilar and gains the skills of a Master Assassin; he discovers he is a descendant of the secret Assassins society. We’re only a couple of weeks into the new year and I already have a nominee for worst film of 2017. On paper, I honestly thought we had a winner. Oh how wrong I was. What is it about video game movies? Why are they so bad? They have the fan base, the concept, a plot. All packaged and ready to go and yet it still doesn’t cut the mustard. I’m a big fan of the AC franchise. It was a crazy premise. BUT when you’re jumping off towers and free-running up buildings while disposing of targets with cool gadgets, who cared? BUT somehow this dull and meandering affair managed to make that concept seem even more far-fetched and uninteresting. From the opening 10 minutes, you knew what you were in for. A disappointing, disjointed and poorly CGI’d movie. Now credit where it’s due. The writers actually kept to the story line. The only problem was that (as a gamer) those were the bits I’d skip. If it didn’t have anything to do with training or the Assassins, that START button was getting a hammering. It didn’t help that it took itself too far seriously. Cal’s drawn out back story didn’t really set the tempo. And that was the problem, it never really got going! His mother was bumped off (for no valid reason). We had mindless exposition and dull dialogue as Fassbender did his utmost to keep things watchable. I still think he was the right choice for the role. I just wish he had better material. I was 30 minutes in and already nodding off! Even when Cal was picked up by the sinister Illuminati-esque Abstergo Organisation, it was hard going. They managed to make all the fun stuff with the Animus a bloody chore. A talented cast squandered. Not even Jeremy Irons and Marion Cotillard could save the day. Cotillard was wasted in her role. Anyone could have played her. Irons did fare a little better and could have been an excellent adversary. BUT he was pushed into the background far too much. And by the time he was brought back for the shambolic finale, he was nothing more than a quick witted panto villain. Charlotte Rampling was completely unnecessary as the leader of the Illuminati . . . Or whatever she was supposed to be. Brendan Gleeson actually looked like he was on drugs in his meaningless cameo. There was one thing that bugged the hell out of me the most. What’s the title of the film? 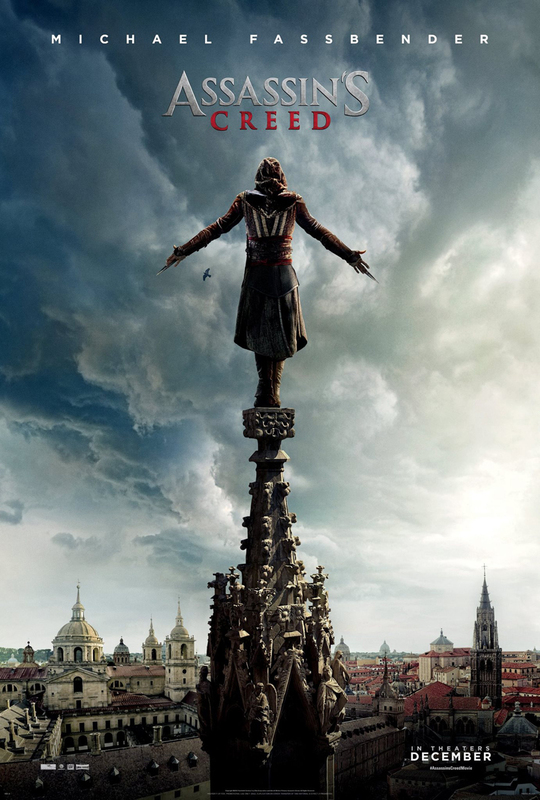 ASSASSIN’S CREED. So where the hell were the ASSASSINS?! The mixed CGI effects and frantic camera work may have been disorienting to watch BUT, at least, it was entertaining. When the assassins were able to do their thing, it was watchable. The rooftop chase was exactly like the game play. A real shame that we had only two or three sequences. Not enough wall sprinting and hay jumping for my liking. The 3D was a waste of time. It definitely wasn’t worth the money for bits of wood and the occasional arrow flying out at you. Dreadful. Every time that blasted eagle soared across Adam Arkapaw’s horribly grainy 15th Century Madrid, it just reminded me how much of an eye sore the visual effects really were. Even the infamous “leap of faith” was a massive let down. It was either disrupted by a quick flick back to Cal messing around with the Animus or hampered down with blurry CGI. It failed to impress on both fronts with the present AND the Assassin stuff. Throwing in characters you couldn’t care about. There was a really flimsy and cliched relationship between the assassins Aguilar and Maria (Ariane Labed) that went no where. No memorable villain. Just a stocky armour-clad henchman and a lechy monk with a really bad bald piece. Michael Kenneth Williams (The Wire) and his highly unmemorable bunch of Abstergo inmates were a complete waste of time. All they did was moan at Cal and waffle on about the Apple. A stupid relic that can end free will. Yawn. IT JUST DIDN’T WORK. By the time the closing credits rolled, I felt as empty and angry as the protagonist. And once Justin Kurzel’s name flashed across the screen, the die was cast. Reuniting with Fassbender and Cotillard to fail with another adaptation. First Shakespeare, now one of the highest grossing video game franchises in the last decade. Third time’s the charm? I wouldn’t bank on it. The cast did their best BUT they were always going to fall short. Poorly executed, dreadful CGI, a meandering pace makes this one to AVOID. The only good thing to come out of this was that it made me want to revisit the old games.